If you like the outdoors, you'll love running in Oslo. Like all the other Scandinavian capital cities, the town has a close-to-nature, provincial character, with lots of natural scenery to run through. 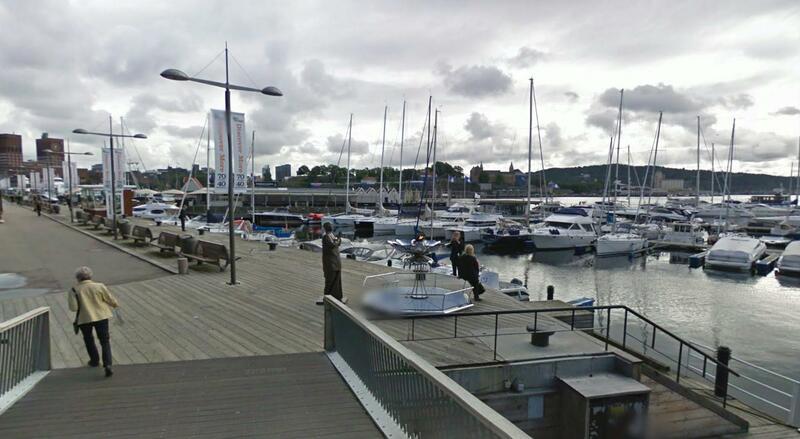 With its location at the end of Oslo Fjord, there are sweeping views of the water and its many islands, and mountains rise up right behind town. You can choose flat trails along the waterfront, or run straight up a mountain, if you please. You can run out onto peninsulas or even take ferries out to several islands and run there. And for you trail runners, you can even take the tram up to Frognerseteren at the TV tower and then just run north into absolute wilderness, full of wooded mountains and lakes. This route is what I consider my basic Oslo route, looping through the old center of Oslo, taking in all the basic tourist sights: the royal palace and its park, the main, park-lined boulevard with its university, theaters and the parliament, then discovering the old admiralty buildings at the waterfront, the fort, the redeveloped harbor with its windjammers, ferries and restaurants, then returning by the famous city hall. All that in one normal jogging distance of about 8 km. We'll start in the heart of the city at the intersection of Karl Johans Gate ("gate" means street, and not gate) and Rosenkranz Gate. The Grand Hotel is right there, and though you probably won't be staying there, this is definitely the spot to be. Karl Johans Gate is the town's main boulevard, stretching from the royal palace up on the hill to the west, to the main train station to the east. 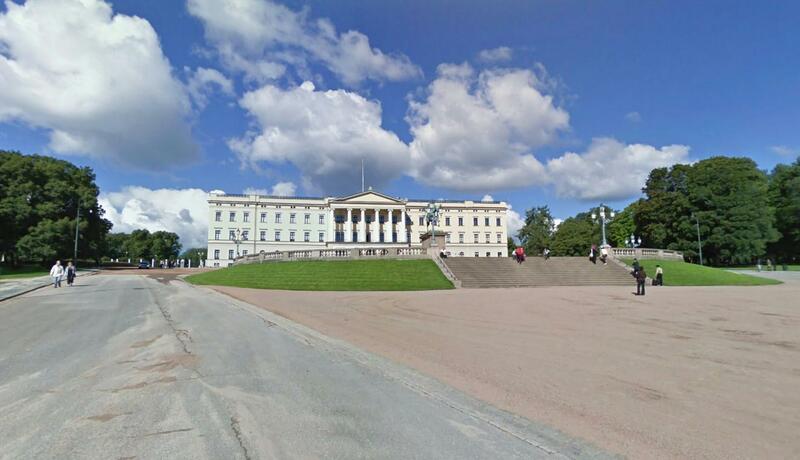 The Parliament (the Storting) is just diagonally across the street from our starting point, and the street is lined by a pleasant park on the other side. We'll first run up to the palace, which you can already see throning upon the hill, and then come back down the other side of the street. 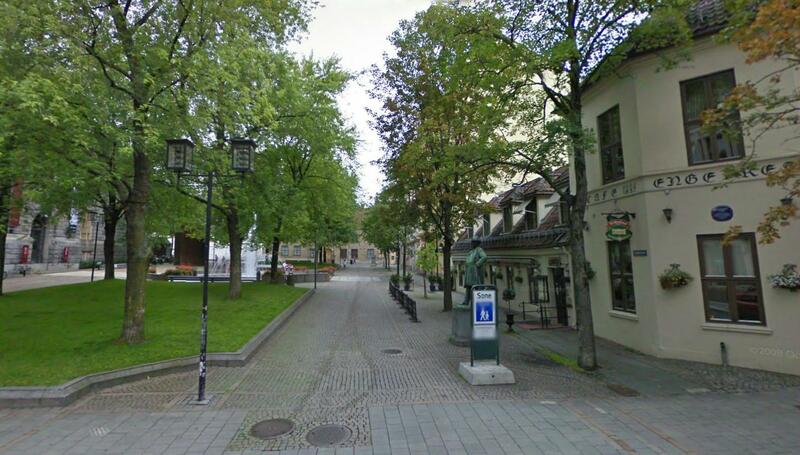 So off we go, heading west on Karl Johans Gate, with the park on our left side! It's just two blocks to the palace grounds, with the old university buildings on the right. Keep going straight up the drive to the palace: it's open to the public, even in the evenings. You can jog a loop around the palace, through the park, and come back out in front again. Once back at the palace entrance again, head back east down Karl Johans Gate, through the park this time. 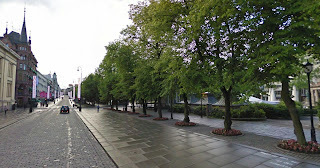 The Norwegian National Theater is the first building on the right, then, at the Storting cut back onto Karl Johans Gate, which becomes a pedestrian street, the main area for nightlife in Oslo. After 4 blocks you'll see the old cathedral on the left. Now it's time to head to the waterfront. So turn right on Kirkegata (Church Street), right at the front of the cathedral. You'll run through 4 blocks of unspectacular downtown buildings, but then you'll come to the leafy square in front of the Mint, on the right. After another block, there is another nice old square on the left side. 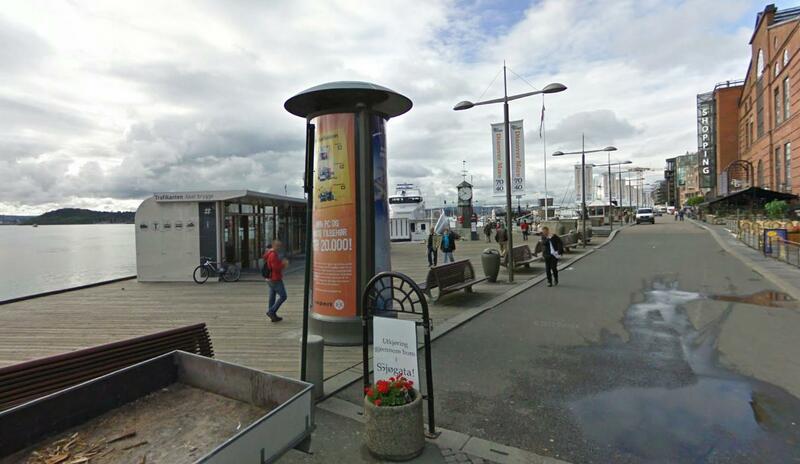 After another block straight on Kirkegata, you'll come to the gate of the old Norwegian naval headquarters. It all looks like a military museum from 200 years ago (part of it IS a museum), but most of it is still in use by the navy). Hopefully, the gate will be open and you can loop through it. It's not too big: just a few buildings. 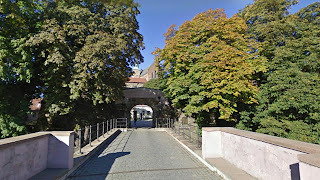 Otherwise, turn right and go right to the Akershus fort, just 150 meters away. Akershus is a fascinating fort/castle built up over the centuries. If you're not too late, you can just jog inside, there's no entrance fee. If the gate's closed, you'll just have to loop around it from the outside. There is a collection of castle buildings, cannons and lookout vistas from the fort walls inside, and real sentries who watch over this still-used military base. Exit at the same spot where you came in (or if you couldn't get in, you're still there!) and go south, towards the water on Kongens gate (King Street). The waterfront begins just past the end of the fort. Turn right and run beneath the castle walls, where the cruise ships and visiting naval ships dock up. I always enjoy jogging out onto the docks to get a close look at the the windjammers that are always found there. At the north end of the fort, the waterfront curves away to the left. Just keep following the water. Here, in the old harbor, there are lots more windjammers at the docks. The route curves around the northern tip of the harbor, and here is the ferry landing for trips to the various fjord islands (that's another route description!). You're now entering the Aker Brygge harbor redevelopment, full of shops, restaurants, a marina and tour-boats. You can continue running out to the end of the harbor promenade, and then either turn around and run back to the ferry landings or loop behind the buildings and run back that way (I like being on the water). Once back at the ferry landings, you'll be looking straight at the looming city hall building (Radhus), with its twin brick towers. Let's run over and take a look at this architecturally acclaimed building. The shape is typically Scandinavian modern. But the part about it that I like is the amazing detail-work put into it, whether the brickwork itself, the windows, the statuary, everywhere you look you'll see great craftsmanship. You're looking at the back side now. So run straight ahead to look at the other side and the main entrance. Go up to the entrance and then wander down the arcade walkways to either side. They are lined with carved wooden scenes from Norwegian sagas from the Viking times. We're just 2 blocks from where we started from now, so turn your back to the town hall and run straight the one block north to Karl Johans Gate and you'll see the starting point one block to your right. Thanks for that - in Oslo on work and just did the run. Good introduction to the town. Thanks for posting this- we arrived in Oslo last night and this excellent run in beautiful weather this morning means we already feel we have a little feel for the city!